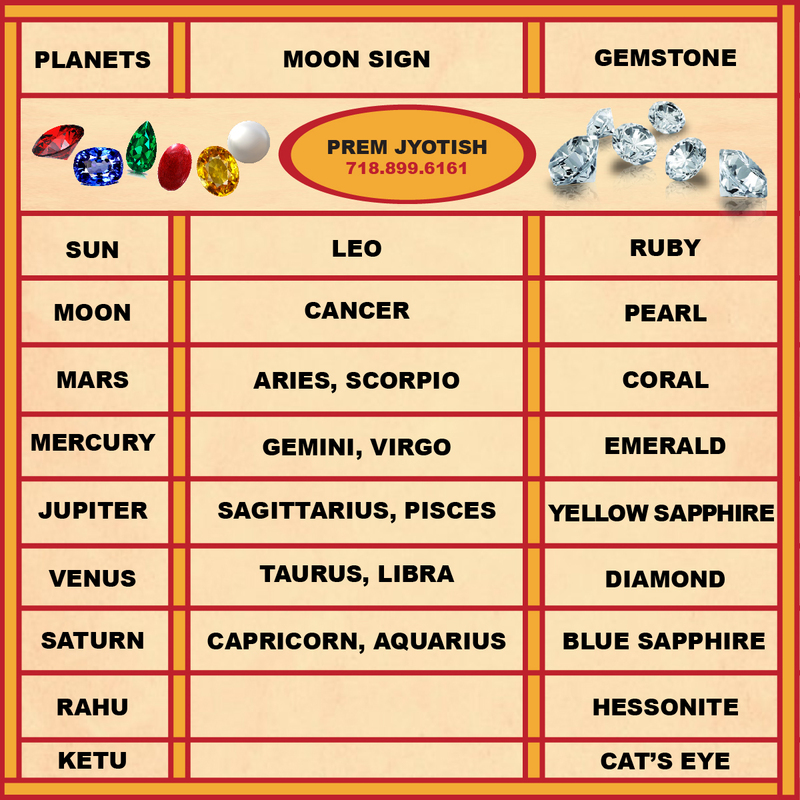 Planets help shape our destinies and under vedic astrology the ruling planets also have corresponding gemstones on earth. Identifying your ruling planet and moon sign will help you understand what gemstone to wear. Gemstones channel energy from their corresponding planets; the raw material and matter of each type of gemstone creates a unique makeup which is sensitive to certain planets’ energies. Therefore, wearing certain gemstones can cause both positive and negative effects. It is important to keep in mind that wearing certain combination of gemstones might have either adverse or beneficial effects. Certain periods or months might also change the makeup of what gemstones will provide to be the most positive results for you. If you remember from our previous blog post “The 12 Zodiac Signs and Rashi” your moon sign is different from your sun sign, which is your everyday zodiac sign. Your moon sign is determined by where the moon was in transit during your birth. Unlike the sun, the moon takes 28 days to go through the 12 zodiac signs so its location is present in a sign for only 54 hours which requires a deeper exploration to assign a moon sign to a person. Your moon sign, in actuality, is more important than your zodiac (sun) sign as it takes a deeper look into your daily life and energies around you that help shape your future. To know what gemstones to wear (aside from just your birth stone) and to correctly identify your moon sign (not your sun sign -- everyday zodiac sign) Book an Appointment today and learn in detail how to channel the energies of the planets towards success and happiness.